Check out the full announcement in the press release below, and head over to photoplusexpo.com/register to get signed up. New York, NY – June 9, 2010 – PDN PhotoPlus International Conference + Expo, named one of the best trade shows in the U.S. by Exhibitor Magazine three years running, announced today that attendee registration for the 2010 PDN PhotoPlus Expo (PPE10) is now open. PDN PhotoPlus Expo 2010 will take place from October 28-30, 2010 at the Jacob K. Javits Convention Center in New York City. Attendees can register free at (www.photoplusexpo.com/register) or purchase a special PhotoPlus Gold Expo Pass at a reduced cost for a limited time at only $49. The Early Bird Rate for the Gold Expo pass expires on October 15, 2010. The Gold Expo Pass offers tremendous value to attendees and provides exclusive VIP offers including a Nikon Gold Expo “swag bag” filled with a variety of premium items, priority admission to keynote sessions and special events, access to the Gold Expo Oasis, a private lounge area, 2 tickets to the 8th Annual Lucie Awards held October 27 at Lincoln Center, discounts around town, and much more. Attendees to this year’s show will gain valuable knowledge and inspiration from some of the greatest photographers and imaging experts in the world, with over 100 seminars, special events and hands-on workshops. In addition, this year’s seminar and workshop schedule places special emphasis on the convergence of still photography and video to help attendees learn more about the direction new technology is taking the world of photography. A complete schedule of seminars and workshops will be available at www.photoplusexpo.com at the end of July. Designed for professionals in the photographic and imaging industries, PhotoPlus showcases the latest advances in photography, both traditional and digital. 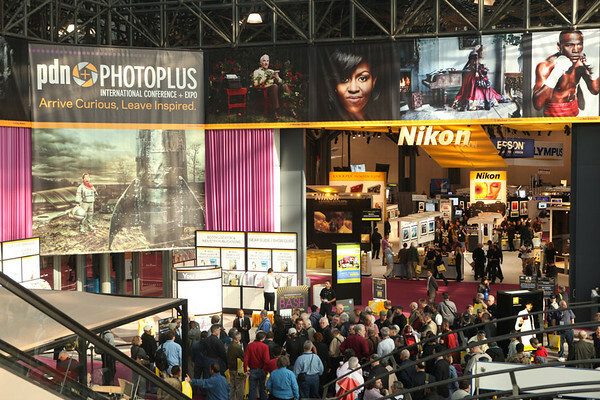 Held annually at the Jacob Javits Convention Center, attendees have the opportunity to explore an inspiring array of photography and imaging products and services – everything from image capture and color management to retouching and storage – all from the industry’s leading manufacturers. The show also offers over 100 photography and imaging seminars and hands-on workshops taught by world-renowned experts with a focus on cutting-edge innovations in digital imaging products and techniques.